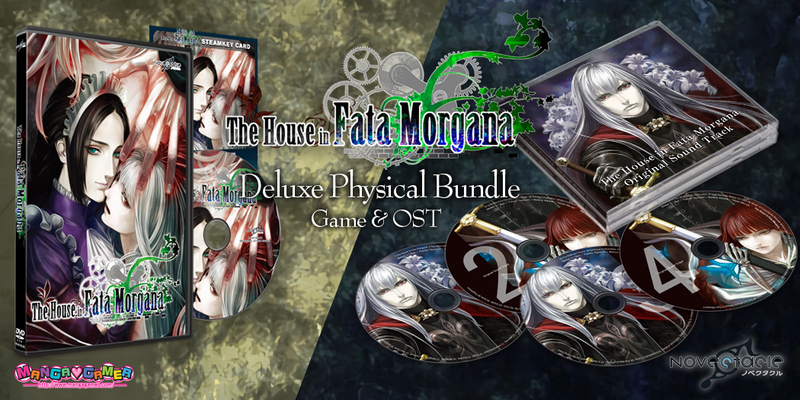 The House in Fata Morgana Physical Edition Now On Sale! The physical edition of The House in Fata Morgana is now available for purchase! The physical edition of the game features the game on disk, a Steam key card which entitles you to not only the game on Steam but also the digital version of the sound track, and a reversible jacket. The physical soundtrack is a massive four disk set with 68 tracks (that’s over four and a half hours of music), including two unused tracks and a soundtrack-exclusive medley! Pick them up individually or as a bundle at a discount! Tagged Hardcopy, Novectacle, the house in fata morgana. « The House in Fata Morgana: A Requiem for Innocence Now On Sale!